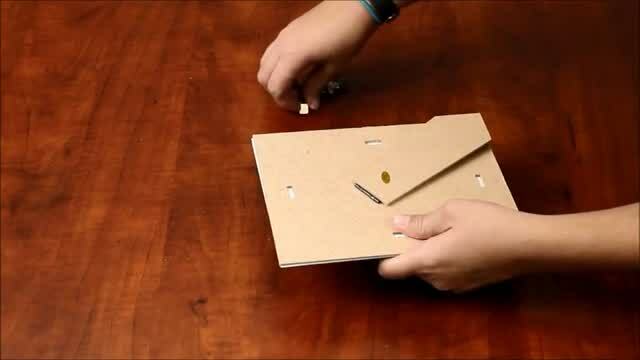 (6) Spring steel clips secure the 1/8" tempered glass panel and 1/8" chipboard back together. 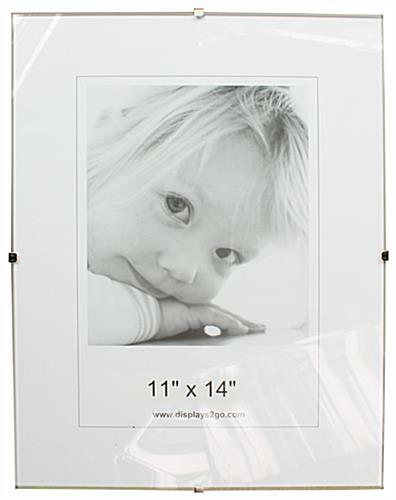 Affordable frameless 11" x 14" portrait displays are for wall mounting use. 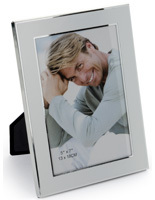 This glass clip picture frame is available at a low price. 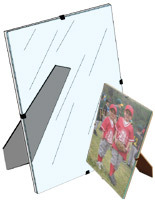 Many buyers will order these image holders in large quantities for bulk savings. Each poster holder is a glass clip picture frame that has rear mounting brackets for mounting the display on a wall. These photo holders are not for tabletop use. 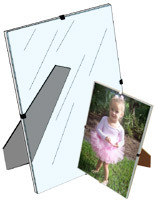 Each glass clip picture frame can be used in either portrait or landscape orientation. These timeless print holders keep the prints free from damage. 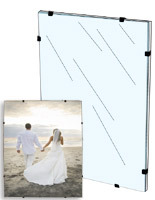 The large size of this frameless glass picture frame is not safe propped up with an easel. The front panel of this sign holder is tempered glass, which is much safer and stronger than regular glass. These 11" x 14" frameless photo frames with discounted bulk pricing are ideal for outfitting an office, retail location, or a restaurant. 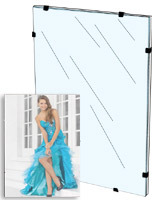 The large format of these clear image holders let your printed ads or artwork be the center of attention. 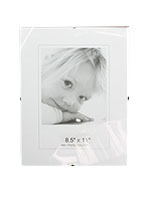 This glass clip picture frame can be showcased in either vertical or horizontal orientation to work with any design. 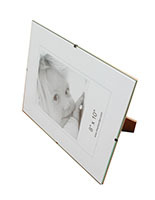 The frameless design of this photo holder makes the images the focal point. Each poster display has six spring clamps around the edge to hold together the backing, sign, and clear lens. To insert a document, users just need to remove the (6) clips and take off the lens to swap the graphics. 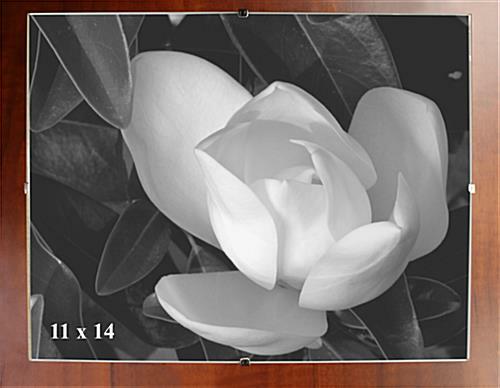 The elegant look of these frameless photo displays are sure to catch the attention of visitors or customers. We have lucite and chrome coffee tables and end tables in our living room which look great with our two suede sofas and patterned armless chairs. The frames are just right for the decor and complement it perfectly. I am very happy with the purchase and the cost. They were easy to assemble. I am sorry I am not very talented with doing videos! Thanks for taking the time to review your experience shopping with us Clementina!